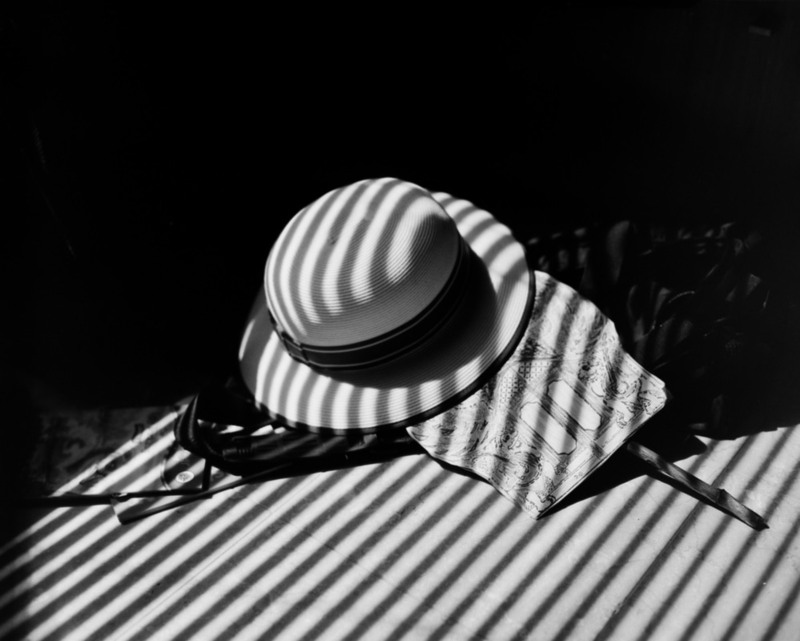 People often refer to the pedigree of the Leica M as being something more than the mechanics of the camera, a history that cannot be ignored when using any Leica M camera. While this might be true of a Leica, it is definitely true of the Graflex Speed Graphic line. Instead of Henri Cartier-Bresson we have Weegee, instead of Wetzlar Germany we have Rochester New York and instead of the D-Day landing we have virtually every picture taken during WWII for the allies. The Graflex drips history but it does so in a undignified way. For anyone who has read Weegee's autobiography can attest, this is a history of the common man doing extraordinary things. But this is exactly what the Graflex did. So lets dive in and see what this camera is all about. I first bought my Crown Graphic about three years ago off of eBay. My camera is an earlier model, pre-1955 as it comes with a Rangefinder bolted onto the side. This camera came about because of the need of having a "press" camera that could be used quickly. 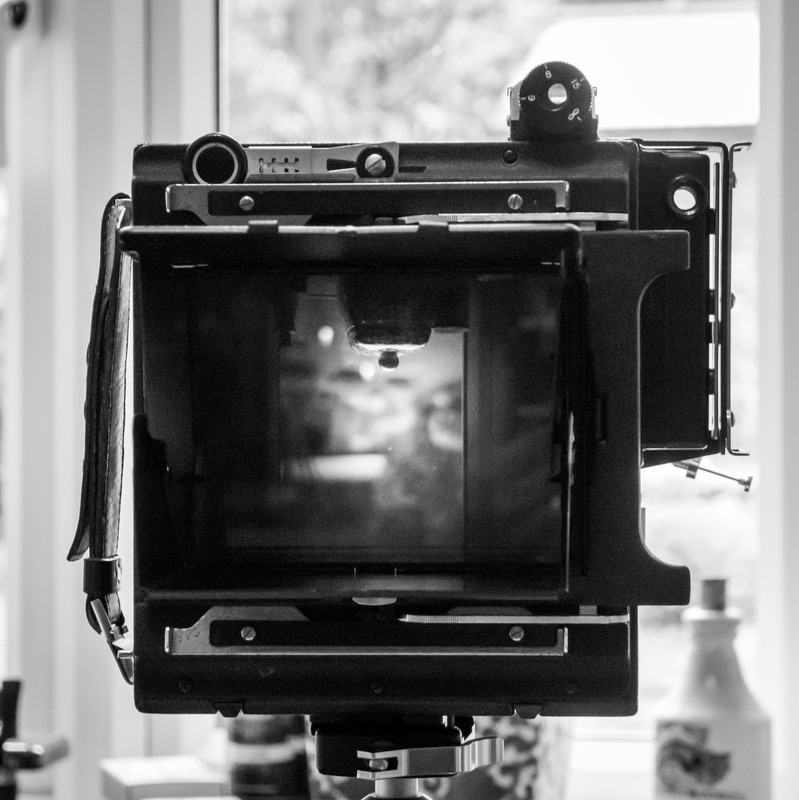 During a time that usually saw contact prints being used, a 4 x 5 camera was a perfect solution. The challenge was how to use a field camera quickly for reportage style photography. 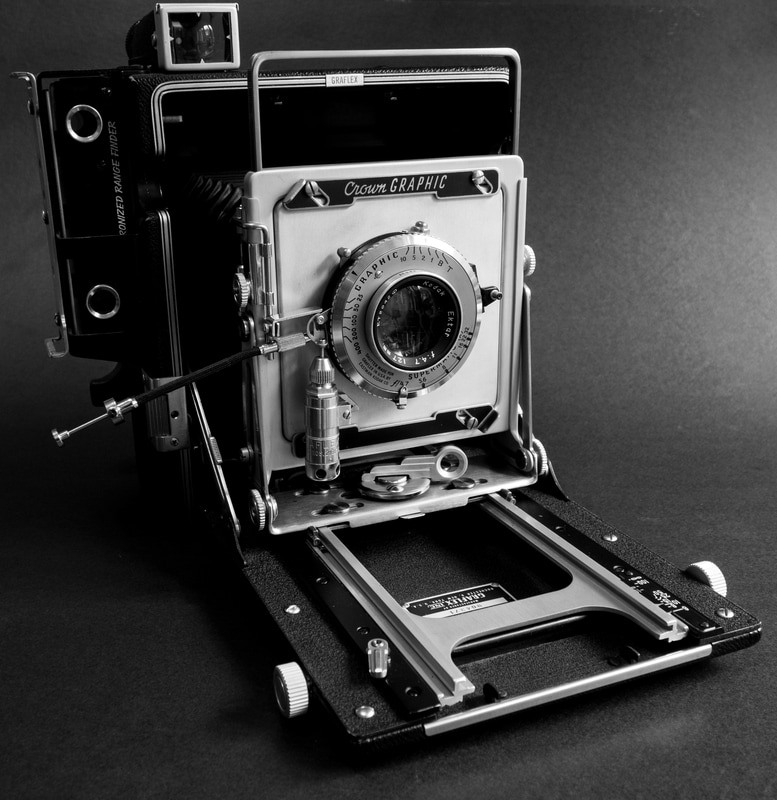 The Graflex company responded with the Speed Graphic range. I purchased a Crown Graphic, which came with a rangefinder and the Ektar 127mm f/4.7 lens, which is plenty sharp at f/8 and reasonable wide open. It was designed to be shot quickly and has various framing tools to help the photographer to get the shot off fast. I believe it was really designed to shoot at f/16 with a flash which would ensure focus and simplify the exposure calculations. This was not designed for the portrait or wedding photographer. It was designed for the press photographer or war coorespondent. Even the "kit" lens of 127mm is very wide for a Large Format camera, showing that the intended use was not scheduled portraiture. The mechanics of this camera are all located in the lens. 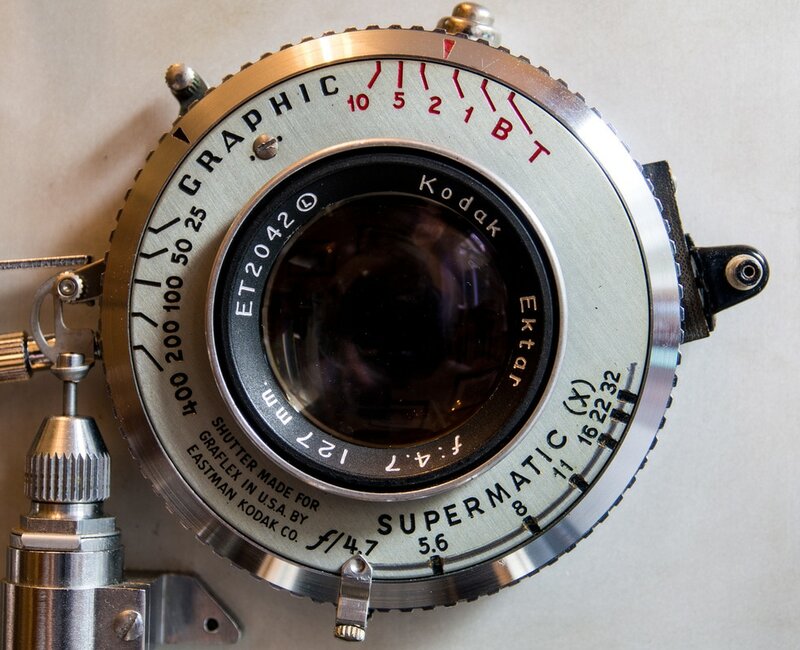 The aperture and shutter are all contained in the lens itself. The camera itself has a push button shutter on the camera body, designed again to hold it up to your face, compose and pull the trigger. This is mechanically connected to the lens which is where the shutter is really triggered from. I have also added a short cable release not he lens itself to help me trigger the shutter with minimal movement while the camera is on a tripod. This avoids camera shake as most of the shots I take have the camera on the tripod. In regards to sharpness, these lenses are solid performers however the new coatings that modern lenses have give them a great advantage. Keep this in mind when you consider these camera. On the back end of the camera you can see the ground glass and the inverted image. The inverted image takes a bit of getting used to, however it can show you a different perspective of your image which can, if used properly, help you find the strongest composition. From this vantage point you can see the rangefinder on the right side of the camera, a quick framing on the top right, and laying down you have another framing tool. Again Graflex was looking to make this camera quicker to shoot. The ground glass on these cameras are old and by changing them out you can get a much brighter image. You can even get some with grid lines to help you align your images. This is a small investment that can improve your enjoyment greatly. This large camera, collapses down to something that is a mere four inches thick! This makes it easy to throw into a backpack, add a few film carriers and take it with you. For a large format camera, we would be hard pressed to find one so travel friendly. Below is the quick and dirty steps I used to capture an image. For a light meter I use the iPhone app with the same name. It is always with me and meters remarkably well. Set camera on a tripod. It is very portable and relatively easy to use. It is solidly built and beautiful to look at which adds an unexpected benefit, in that every time I have pulled out the camera in public I get curious people coming up to look at the camera and ask me about it. It makes it very easy to strike up conversations and people are extremely willing to sit down and have their portrait taken. The lenses are solid performers and the image quality it can capture is amazing. It does not have all the movements of a true field camera and the film holder does not rotate in the portrait orientation. This means you have to turn the entire camera on its side to do so. It is built like a tank and weights a good deal, especially with the rangefinder attached. This Crown shutter speed goes to 1/400 sec which given the fast films of today is not very fast. I suggest getting film with iso around 100 as any faster and you run the risk of maxing out the shutter speed. Overall I believe that any of the Graflex 4x5 is a great camera to try large format on. They are inexpensive and easy to obtain. Mechanically they are simple with little to go wrong. While they lack many of the movements that are essential for a field camera being used in architecture, the fact is that few of the missing movements are ever used in landscape. With a longer lens, 203mm or so, this can become an excellent portrait camera. Currently these cameras are going for around USD 300 each depending on condition. I highly suggest staying away from the 2x3 and going with a 4x5. The 2x3 is hard to find film for and is not really a large format camera. So you get all the trouble with less of the benefit. The cost of large format is in the film. Each negative will run around USD 2 which means a pack of 25 is around USD50. The good news is that you do not shoot it as much as a 35mm roll camera. It takes time to load each negative, set up the camera and take the image. A box of 25 negatives can last me a year very easily. Obviously my 'hit' rate on these images are much higher as I think about each image a great deal. Getting into large format photography is not cheap but this is arguably the most economic way to do it. The Graflex camera lines are brilliantly made and continue to work very well. For the low price you are buying into some wonderful history! 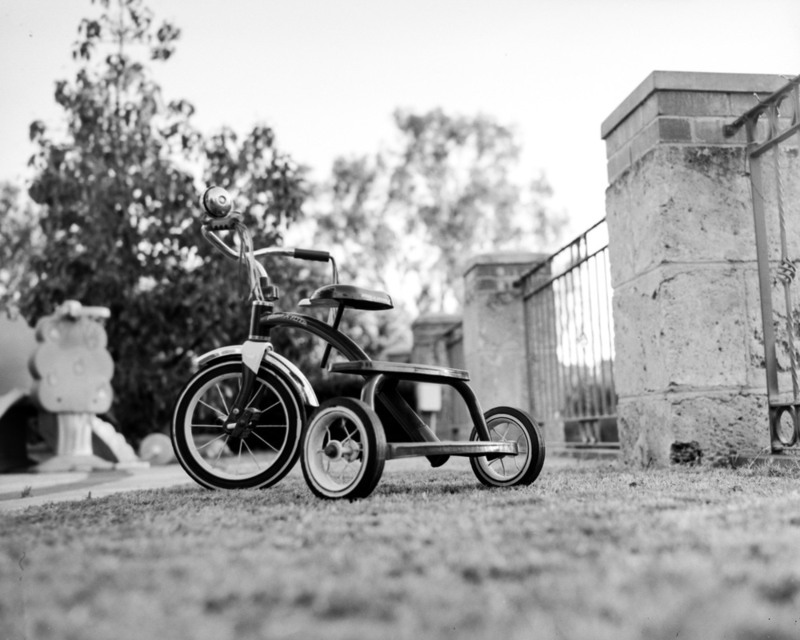 Below are a couple of images I took with my Graflex. I 'scanned' them with my Olympus OMD. A solid overview on the camera and how it works HERE. A good show on how to use handheld HERE. Mother of all Graflex Websites HERE.